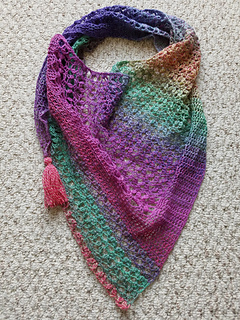 Flower dew shawl with a slightly asymmetrical triangular shape. It’s fun play of lace and simple dc which will show beautifully when worn. The asymmetrical shape makes it look elegant and modern. It can be worn in a multitude of ways. 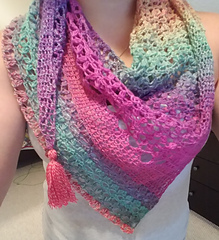 Wrap it around your neck as scarf, wear it like a cowl or bandanna, or just throw it over one shoulder to give a pop of color. Enjoy 40% off** when buying any 10 patterns with coupon code 10PACK.